Search engines help you, well, search for information on the internet. Not to be confused with browsers, such as Tenta, which are applications that let you access the internet. Most search engines aren't too concerned with maintaining your privacy, and in fact use your searches to develop a profile of you to which they can then advertise to. If you’re sick of ads popping up related to things you’ve searched for on one of the main search engines, consider using a private search engine. 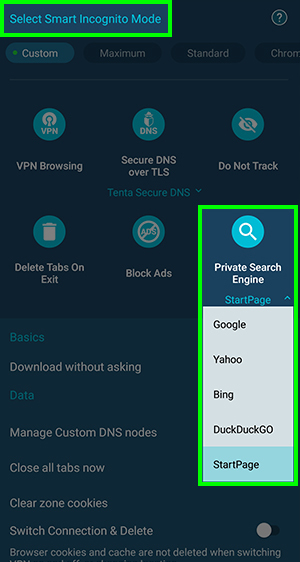 Tenta Browser provides multiple search engine options, including private search engines StartPage and DuckDuckGo. Here's how to manage them. Step 1. 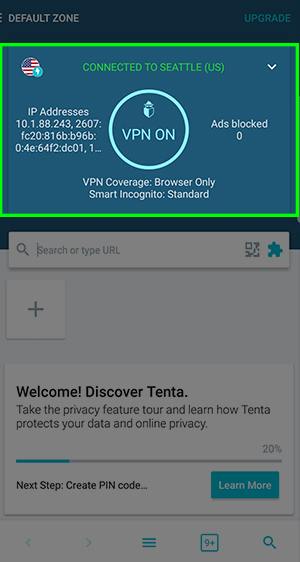 Open the Tenta homescreen and tap anywhere in the connection card to open Zone settings.